Titanium compensation is certainly the best solution if you decide to make new teeth on a metal basis. What makes titanium (titanium) a unique and undisciplined material for dental restorations, especially crowns and bridges, is its excellent traits. Creating crowns with a titanium base is based on the CAD / CAM technology principle, which gives added safety in the quality and compactness of the metal base itself that is computed. Allergy to foreign body (metals) in the body occurs in about 30% of people. When TITANANIUM is concerned, from bone surgery to the installation of dental implants, there have been no allergic reactions recorded for several dozen years. Titanium is the so-called. neutral metal, which on the surface forms one of the most resistant oxides. It protects the crown or bridge from damage from salty or acidic environment, and from aggressive bodily fluids. In order to avoid the release of metallic ions that occur in standard metals and which may adversely affect the body, TITAN is used, but tested and tested material, biocompatible to the human body. Titan leaks RTG rays, so it is the only material for which toothbrush or bridge should not be removed for early and reliable caries diagnosis when taking teeth. That’s why it saves time and, more importantly, saves the tooth substance that is removed when removing the crown. Comfort, high strength, neutral flavor and lightness like a feather equals it with the properties of Gold and its alloys! Titan is extremely robust. And if we compare the metal-ceramic bridge with a titanium-ceramic bridge, it is noticeable: that the titanium bridge is much easier. In addition, the titanium is a neutral flavor, i.e. The taste of the metal does not appear in the mouth, which can occur in metal ceramic crowns and bridges. 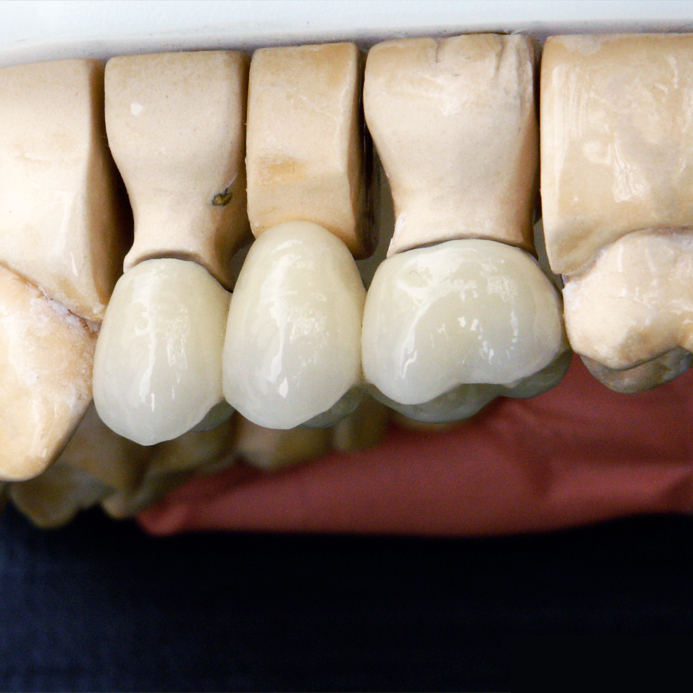 Titanium is applied to a layer of premium ceramics, which gives the patient maximum aesthetic pleasure.